PERRYSVILLE, OHIO – The new cast acrylic RestoreTM ACR Walk-In Tub from Mansfield Plumbing boasts a low 7″ entry threshold, 17″ high ADA-compliant seat and easy-to-access cable-operated drain. Available as a bathtub, whirlpool, air bath, combination whirlpool and air bath, or MicroDermTM Therapeutic Bath, Restore ACR is IAPMO approved and is manufactured in the U.S.A.
Bath: A soothing soak in warm water. Whirlpool: 12 adjustable jets (4 lumbar jets, 4 leg and calf jets, and 4 body jets) that focus on aching muscles, an inline water heater, ozonator and Chromatherapy color light system. Air Bath: 16 air injectors to gently relax the body plus the Chromatherapy color light system. 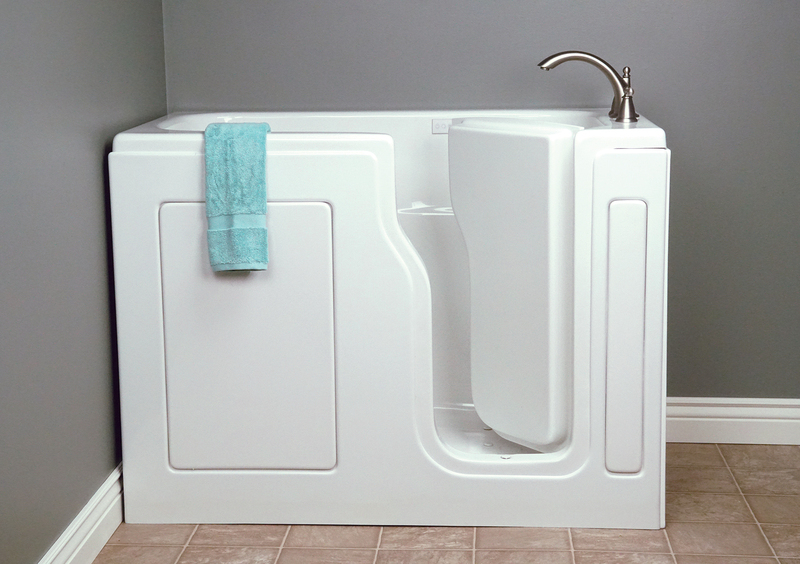 Combination Whirlpool and Air Bath: 12 adjustable jets (4 lumbar jets, 4 leg and calf jets, and 4 body jets) and 16 air injectors maximize the bathing experience. Inline water heater, ozonator and Chromatherapy color light system. MicroDerm Therapeutic Bath: The infusion of millions of oxygen-rich microbubbles help the bather relax, while softening and exfoliating the skin. As microbubbles burst against submerged body, heat is released to invigorate the skin surface and warm the water, increasing the temperature while eliminating the need to add hot water to the bath. The original Restore gelcoat/fiberglass tub is still available from Mansfield Plumbing and comes in a selection of soaker, whirlpool, air bath and combination styles.